Cut from the same cloth as recent documentary successes Bowling for Columbine and The Corporation, Super Size Me is a humour-laden look at the obesity trend in the U.S.A. and the culpability of the fast food industry. 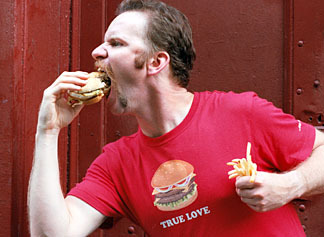 In the wake of a lawsuit aimed at McDonald's about the detrimental effect of eating their food, filmmaker Morgan Spurlock documents his own journey of eating nothing but McDonald's for one month. What starts out as a light-hearted experiment turns a bit scary once the diet starts wreaking serious havoc on Spurlock's health and wellbeing. Interspersed with Spurlock's personal observations are an impressive array of interviews with doctors and lawyers, lobbyists and nutritionists, Big Mac enthusiasts and vegan chefs.